You sit alone, for hours and hours, and years and years, creating characters, telling stories, imagining lives. You live through the good days and the bad days. You slog away, you persevere, even when everything seems utterly hopeless and you think you’ll never write another word. Finally you have a book. Except that it’s not a book, not really. It’s a very long Word document, perhaps. It may be a vast stack of paper, liable to topple over and get messed up with one clumsy swipe of a forearm. 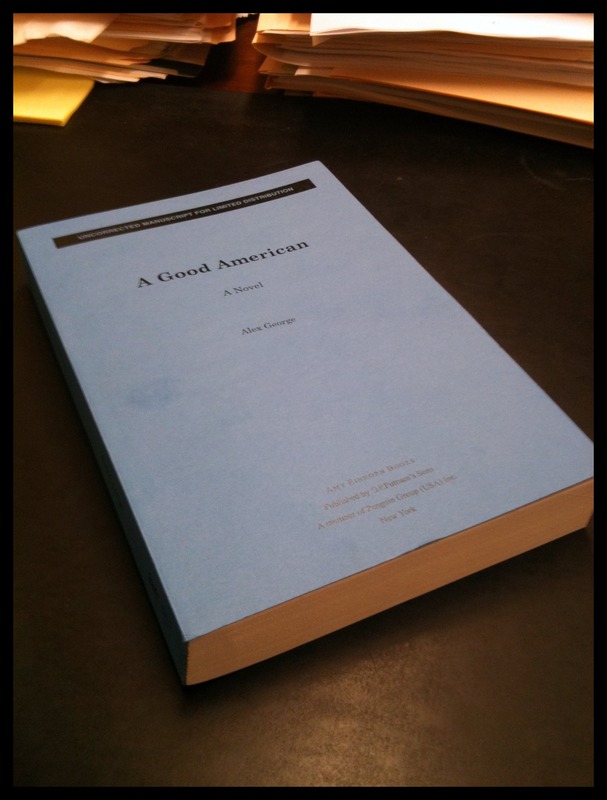 This is an unformatted, unproofed galley (no fancy cover, you’ll notice) of A GOOD AMERICAN, which my publisher has put together to send to early reviewers, foreign publishing houses, and the like. And for all its slightly unprepossessing appearance, I adore it. Because after six years, I finally have in my hand something that actually looks like, well, a bloody book. There is a weird disconnect here, I realize. Generally speaking, books are not important as objects. It is the stories and characters and ideas that inhabit their pages that give them meaning and value. Good books can enrich us in a deep, but deliciously intangible, way. But for all that there is something very special, as an author, when you see the manifestation of all your hard work in physical form. Being able to pick it up and flick through the pages is a rather wonderful feeling. It’s strange, this sudden objectivization of my efforts. Over the next several months my words will be reformatted and copy-edited. Their look and feel will be re-designed. A cover will be created. The story I have told will not change, but the book will grow into something else, something wonderfully new. I can’t wait to meet it. Exciting! Congratulations, Alex. Should I expect to see this on the Kindle or iBooks at some point? Also, what influence do you have over the cover? Would a Joel Sager fit the feel of the novel? Yes, Ryan, the book will be available as an ebook at the time of publication of the hardback. Also, may I suggest this plugin? You might see more of a dialogue here.